I prefer to dwell in small things. As a child, I made make-believe miniature worlds for the tiny beings I had crafted from puff balls or paper bags. I am still doing this, having expanded them onto the page, or into an animation. I find a sense of safety, warmth and joy in the worlds I create. I have also always loved nature, having grown up in the woods of Colorado collecting small berries and leaves for my self-made books, nursing aspen trees’ wounds with (I see now, unfittingly) other trees’ mashed up leaves. My relationship with nature has come to take a central position in my artwork. You see, as an adult, I am quite easily overwhelmed in our high-speed modern world. I can’t keep up, I don’t fit in, and I find more truth in the structure of a pinecone anyway. I find the essence of the important side of life in small things. Small things as reflections of greater things. Small things – including small moments – hold their own entire universe waiting to be discovered. I like to escape into these tiny universes. To dwell there, to explore with my eyes and my pencil as if I were tiny enough to walk down into that pinecone, or through a barnacle landscape. Each scale is different, each barnacle is different, but they create such a pleasing whole, they embody quality in such an honest way. Hence I have grown to trust irregularity over perfection. I believe it resonates more with the soul. That is why I have a great insistence on hand work. The spirit lights up when confronted with a hand-embroidered textile, or a sketch made in a happy moment. And I’m here for the spirit. I hope to provide a refuge for those who are overwhelmed like me. I hope to bring honest beauty to a world saturated with consumerist-driven aesthetics. That is my tiny place in the world - come visit any time! Mr. Morris lived during the industrial revolution and insisted that the quality produced by hand work could never be obtained with machinery. He was disappointed by the companies prioritizing speed and efficiency, creating shoddy products and bad conditions for the workers. 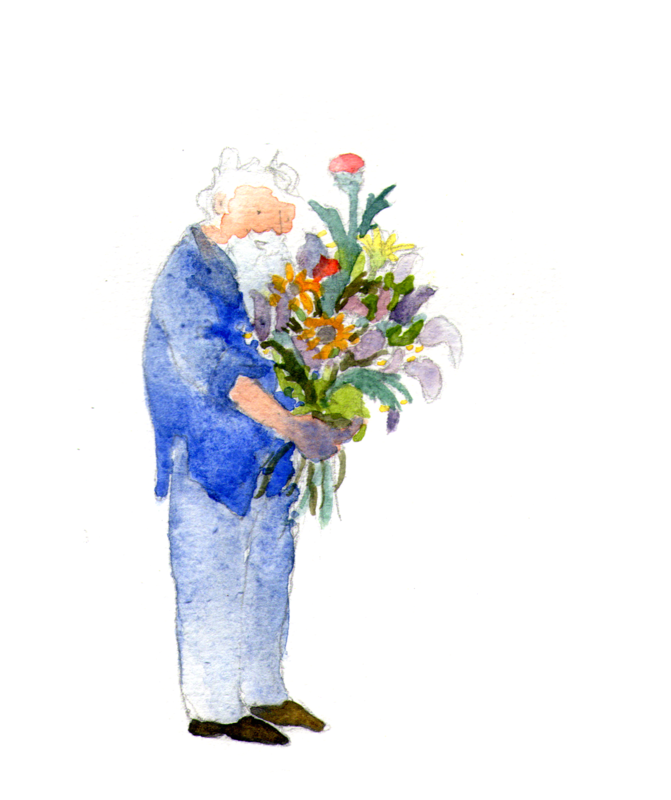 I've painted him in his classic blue garments, fingers stained blue from the indigo he was perfecting (he insisted on natural dyes), holding a bounty of native flowers, one of his chief inspirations.